Allah has possession of all majesty, perfection and sublimity. All majesty is attributed to Him; honour itself is derived from Him. He is the MASTER of MAJESTY in His Exalted Self, His Attributes and His Names; the MASTER of HONOUR Who grants His creatures with honour and overflowing endowment; He says, “..but if ye count the favours of God, never will ye be able to number them” (IBRAHIM, 34), “We have honoured the sons of Adam..” (ISRAA’, 70). Allah’s Majesty is Greatness, Exaltation and being worthy of all attributes of praise. He is the MASTER of HONOUR as He has allthe right to be honoured, glorified and be too Exalted from polytheism.From Him all Honour is derived and by Him only Honour is granted. 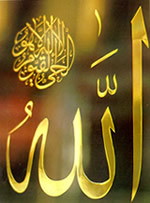 Glorybe to the MASTER of MAJESTY and HONOUR; He is Allah.